While influencer marketing was once primarily a blog-based industry, there are now multiple platforms available, and many sponsored programs don’t include blog posts at all. Being that we are an influencer marketing agency, our CEO is often asked which platform she recommends most, and she has the same response every time: It depends on your goals. That may not be a very satisfying answer, but it’s the truth. 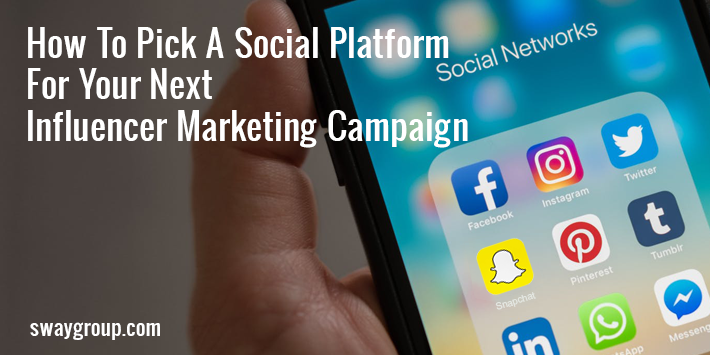 There really is no one-size-fits-all platform that’s guaranteed to work for your campaign. The key is to evaluate your business goals and target audience, then choose the platform(s) best suited for sharing your message. That said, she can certainly share some ideas and suggestions based on her experience monitoring platform performance and influencer campaign successes. She gives a quick overview of each platform’s strengths and when to include them in your marketing efforts in her recent Forbes article here.